Yes, that’s right! The Campanil reporter Tashina Manyak has snagged an exclusive interview with first female Speaker of the House Nancy Pelosi right after the 122nd Commencement ceremony where Pelosi was the guest speaker for the Class of 2010 at Mills College. In this podcast, Pelosi discusses her graduation speech as well as the importance of women’s education and leadership. 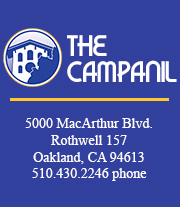 Please help support Tashina by donating to her coverage of the Johannes Mehserle trial this summer in a collaboration between The Campanil and California Beat. Here’s how. A wonderful and effective interview! I am very proud of Tashina. Truly inspiring! Madame Speaker Pelosi is an excellent example for all people.